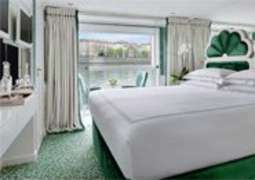 The SS Joie de Vivre is designed to deliver the perfect cruise the River Seine. The one-of-a-kind interiors are inspired by 20th century Parisian design making it perfect to enjoy a cruise to embrace the best of the Seine. Going along with the theme throughout the SS Joie de Vivre the Cabins on board are designed with luxury and comfort in mind. Made-to-order Savior of England beds and marble-lined bathrooms in all cabins highlight a distinctly luxurious and elegant interior throughout the ship. The handcrafted furniture and original artworks are joined by modern touches which make your cruise as comfortable and as enjoyable as possible. You can enjoy some superb dining options on board the SS Joie de Vivre which will add to your distinctly French cruising experience. On board you will find Uniworld's exquisite Zagat-rated food which offers up meals which show the unique flavours and culinary traditions of France. Beautiful dining locations like Le Restaurant Pigalle and Bistro Saint-Germain offer up delicious and enticing dishes sure to satisfy all tastes. For those with a taste for the finer things in life, the Salon de Beaux-Arts Lounge displays a collection of fine art and antiques for your enjoyment as well as an auction if you feel like adding to your own collection. The Le Club l'Espirit features a day spa, fitness centere and swimming pool sure to have you feeling fully relaxed. If you enjoy your food La Cave de Vins will give you a place to dine and try expertly paired wines.